The U.S. and European GNSS programs will launch satellites within a week of each other next month. A GPS Block IIF satellite is scheduled to be lifted into space on October 4 and a second pair of Galileo in-orbit validation (IOV) satellites, on October 10. Meanwhile, the European GNSS Agency (GSA) opened its new office in Prague, Czech Republic, last Thursday (September 6, 2012). 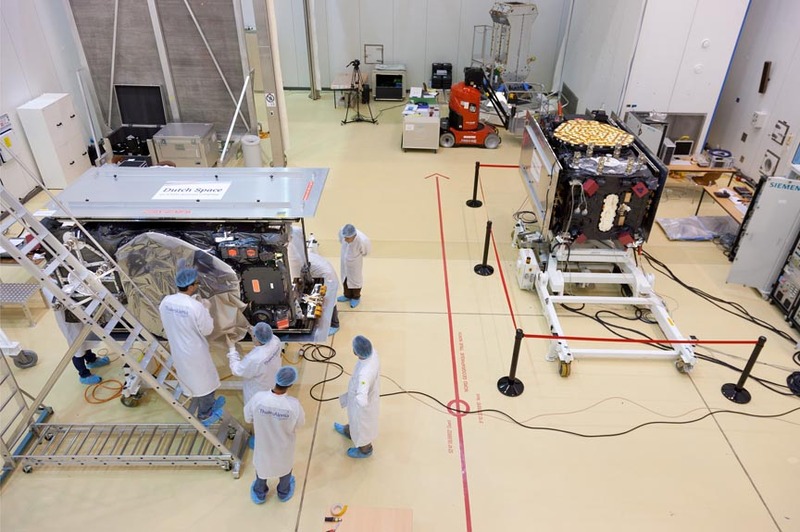 The twin Galileo satellites flight model (FM) 3 and 4, will be launched from the Euroopean spaceport in Kourou, French Guiana, on board a Soyuz ST-B launcher, joining the first two Galileo IOVs that have been orbiting since October 2011. This is a significant milestone for Europe’s Galileo program because four is the minimum number required for navigational fixes, enabling full system testing whenever they are all visible in the sky. As for the U.S. program, according to the National Geospatial-Intelligence Agency (NGA) GPS Division, the next launch of the third Block IIF GPS satellite, Block IIF-3 (SVN65), is scheduled for October 4 at 8:10 a.m. (EDT), from Cape Canaveral Air Force Station, Florida. Designated by its pseudorandom noise (PRN) code (PRN24) and space vehicle number (SVN65), the satellite will be positioned in orbital slot 1 of plane A. In Prague, Antonio Tajani, vice-president of the European Commission and Pavel Dobeš, Czech Minister of Transport, officially opened following several years of coordinated efforts to establish the official seat of the GSA, the future focal point of Galileo program management. The agency will continue to retain an office and some staff in Brussels, Belgium. "The transfer of the GSA to Prague is a key facet in the new governance scheme of Galileo and the important role the agency will play as the program manager of the European GNSS systems, said Sabine Dannelke, chair of the GSA Administrative Board. The board is the GSA’s governing body, composed of representatives from European Union (EU) member states and the European Commission. GSA will take over responsibility for EGNOS program management from January 2014 and Galileo from 2016 under the terms of a new EU GNSS regulation expected to be issued in the near future.